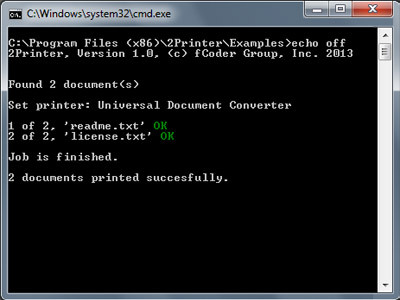 1-2-3 Pdf Converter: 1. Convert PDF to Word 2. Make PDF Files from Word Documents. 1-2-3 PDF Converter is a PDF to Word and Word to PDF Converter, all rolled into one neat document converter. You can convert PDFs to editable MS. Word Documents with the PDF converter's PDF conversion function and make PDF files with the PDF making function of this tool. 2TIFF command line tool can convert PDF to TIFF, XPS to TIFF, JPG to TIFF, PNG to TIFF. Full list of supported document and image source file formats contains more than 275 positions. Batch image resize, change PDF rasterisation resolution, apply text string or image as watermark, split multipage documents to TIFF pages and batch image file color correction features are also supported. Batch compress PDF documents and shrink PDF file size drastically.Free, very easy to use and also multilingual.PDF Compressor that supports drag and drop,integrated into Windows Explorer,supports command line functionality for inclusion in scripts.Whole folders with PDF documents can be compressed.Translated into 38 languages.Supports password protected PDF files.Does not require Adobe Acrobat installed.Shrink PDF files easily. A-PDF AutoCAD to PDF is a fast, affordable way to batch convert AutoCAD Drawings into professional-quality documents in the popular PDF file format. Its easy-to-use interface allows you to batch create PDF files even support monitor hot directory. A-PDF AutoCAD to PDF supports Font embedding, compression and multi-language. A-PDF AutoCAD to PDF supports bookmark, watermark, security, page number, properties and viewer setting. A-PDF Content Splitter is an utility that lets you split Acrobat files into smaller pdf files base on location and text information within the files. It can be used to split composite PDF documents (such as invoices, records or salaries) to pieces by invoice number, account number or employees name which statement in a pdf file. A command line version is included also. A-PDF Data Extractor is a simple utility program that lets you batch extract certain text information within the PDF to XLS, CSV or XML file format. It provide a visual PDF data extraction rule editor to verify and define what data fields to be gathered conveniently and automatically.